True to their pre match boast, the Super Falcons yesterday proved to their Cameroonian counterparts, Indomitable Lionesses, that Nigeria remains the commander-in-chief in African women’s football. The Falcons won their semifinal tie at the Accra Sports Stadium 4-2 on penalties to reach AWCON 2018 final. The victory also guaranteed the Super Falcons a place at next year’s FIFA Women’s World Cup in France. 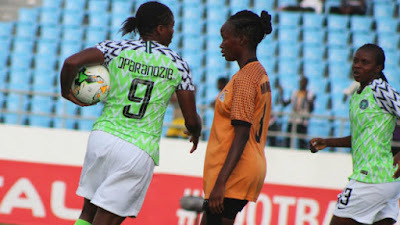 Lithe and sharp forward, Onguene came close in the 4th minute with a rasping shot, apparently from nowhere, which Falcons goalie, Tochukwu Oluehi diverted, and three minutes later, the Lionesses were on the prowl again with a firm header, but Oluehi again was alert. In the 10th minute, Gaelle Enganamouit tested the Nigeria goal with a snap shot, but could not penetrate. In the closing stages of the first period, Nigeria pushed forward a bit, but an attempt by Francisca Ordega to steal the ball from two defenders was fruitless, and Asisat Oshoala’s crisp shot was well saved. Nigeria had finished second in group B after two wins and a defeat, while Cameroun were top of group A with two wins and a draw. Super Falcons head coach Thomas Dennerby made no changes to the starting line up for their previous two games that ended on victory against Zambia and Equatorial Guinea. Incidentally, it was at the same Accra Sports Stadium the Super Falcons made history in 2004, beating the host, Ghana Black Queens 3-2 on penalties with former goalkeeper, Precious Dede, saving three kicks after conceding two in the qualifier to Athens Olympic Games. Yesterday, the Super Falcons created very few chances in the first half, as the Indomitable Lionesses controlled possession and set the tone of the game. After a goalless halftime, both teams followed in the same pattern in the second stanza, as they were unable to get the breakthrough. Thomas Dennerby introduced Falconets stars, Rasheedat Ajibade and Anam Imo, but the game ended goalless at 90 minutes. The extra time also ended goalless, taking the game into penalty shootout. Falcons captain Onome Ebi, Ajibade, Asisat Oshoala and Ngozi Ebere all converted their spot kicks to give Nigeria a 4-2 victory. Goalkeeper Oluehi made one save in the penalty shootout. The victory yesterday was the third time since 2014 the Super Falcons forced a bitter nut down the throat of the Lionesses in the African Women’s Nations Cup competition. Cameroun star, Ajara Nchout, was voted Woman of the Match as she played a crucial role for the Indomitable Lioness, who pressed the Super Falcons. The Super Falcons will face either the Banyana Banyana of South Africa or Mali in the final of the AWCON 2018. Cameroun on the other hand still have the chance of qualifying for France 2019 FIFA Women’s World Cup, if they win the third place match on Friday.